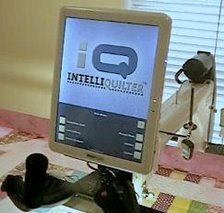 This is a demonstration of batch quilting a pantograph. In this method, the whole quilt is set up but only a few rows are sequenced. In this video I sequence just one row at a time. I am using version 1.30.13. Sorry for the badly out of focus beginning- it does improve. If you are unable to view the video here, use this link http://youtu.be/k-pCKZJKcpE to watch it on youtube.